Adding outdoor fitness equipment helps creates an attractive destination space that encourages people to become active and it also promotes health and wellness within the community. The methods of plyometrics or jump training greatly benefits agility and strength also both muscular and cardio endurance. 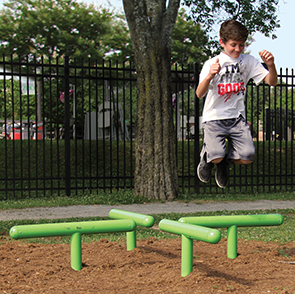 The Log Hop Station allows users to create a cardio, core, strength and balance workout by walking, jumping and running over the horizontal legs to build stamina and elevate the heart rate. Regardless of age or fitness skill level, participating in regular outdoor fitness activities helps maintain the ease of daily activities, improves mood and reduces the risk of injuries and health issues.